Currently, hunger affects 795 million people worldwide. One in nine suffers from hunger. The cause is not a shortage of food. Annual global grain production runs at about 2.5 billion tons. (*1). Distributed evenly among the planet’s population of roughly 7.3 billion, this leaves at least 340 kg annually to eat per head. For comparison, in Japan real per-head consumption of grains per year is 159 kg (*2). In addition to grains, the world produces also vegetables, etc., and taking into consideration existing stockpiles, the world produces enough food to feed everyone sufficiently. Why is there no end to hunger? Then why does hunger persist? To be sure, regions afflicted by hunger face multiple issues, such as limited access to education and a lack of opportunities for earning a living wage. But this is not all. There are many processes from food production to consumption of food we eat daily such as food processing, transportation, selling, and buying, etc. Development of traffic systems to transport goods as well as the technological progress to process and refrigerate food made it possible to distribute food produced anywhere on Earth to any other location. In this kind of world, it is essential to consider issues also beyond national borders on a global scale. In developing countries, agriculture accounts for a high percentage of national economies. Roughly 70% of people directly affect by hunger live in rural areas and nearly all of them are small-scale farmers. Not only do they not have sufficient food when bad weather and natural disaster strike, but earning a stable income becomes a struggle and making ends meet an impossible task. In recent years, poor harvests caused by abnormal weather have been reported from many corners of the world. 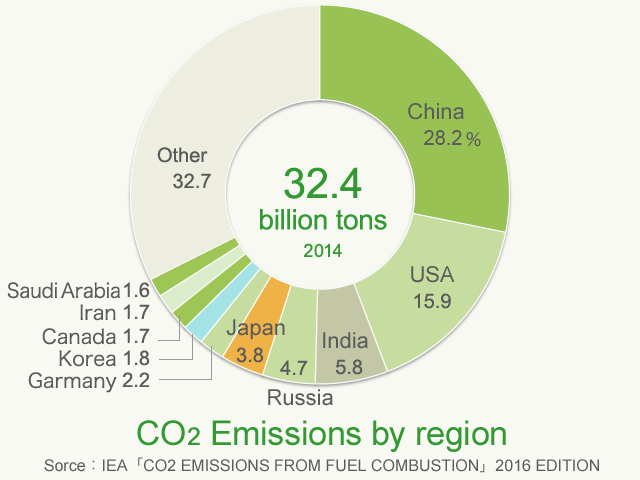 But CO2 emissions, the cause of global warming, stem overwhelmingly from industrialized countries and emerging economies such as China and India. For example, the entire African continent is responsible for just 3.3% of global emissions, less even than the 3.8% attributable to Japan (*3). Global warming, for which actually the high-emission countries should be held responsible, makes it increasingly difficult for people in developing countries to make a living. For example, from Burkina Faso in West Africa we hear that rainfall in recent years has been either insufficient or excessive, and that the cause is not known. 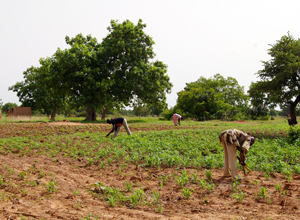 The climate in that country is neatly separated into a rainy season during which agricultural production is viable and a dry season without any rainfall at all. The rainy season lasts only five months from June to around October. 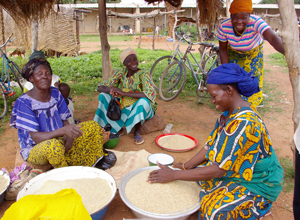 During this time span, farmers need to produce and preserved food for one year in preparation for the dry season. If rainfall is insufficient or late, it will have effects on agricultural production. If the harvest turns out insufficient, for want of other options, people have to reduce serving size and frequency of meals as well as the variety of foodstuff, affecting nutritional status. Moreover, farmers sell their produce to earn cash income to pay for medical bills when family members fall ill. When the income decreases, hospital visits may not take place, deteriorating patients’ conditions. 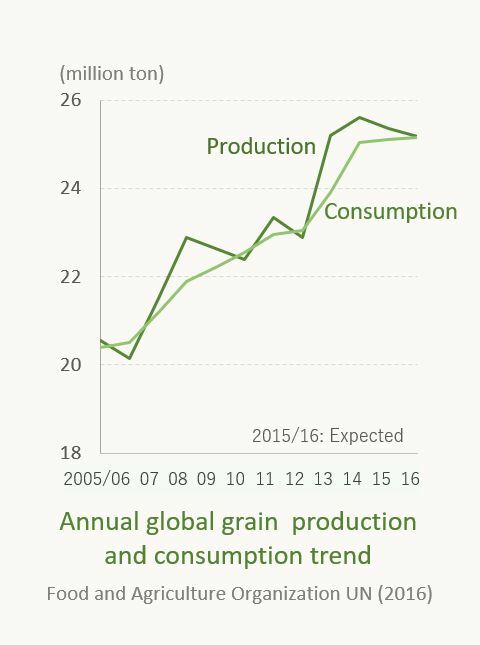 From 2007 until 2008, global cereal production reached a record high at the time. 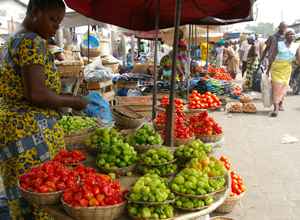 Nonetheless, food prices soared worldwide, creating problems for many. In various corners of the world people’s calls for food escalated into riots, sometimes even with casualties, as happened in Haiti, Burkina Faso, and Cameroon. One reason for the surge in food prices was grains coming into the focus of commodity speculators. Speculation is selling and buying that is not based on actual demand for goods and services but for the purpose of generating short-term financial gains. Since grains are overwhelmingly consumed in the country of production, quantities circulating in international markets are small, with high price volatility as a characteristic. Grains became the focus of speculators when speculators in search of new investment targets in the wake of the 2008 financial crises, prices soared in a short period of time. 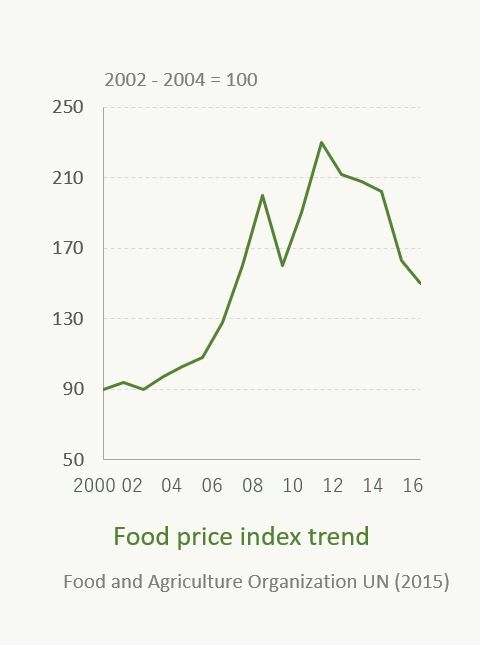 By 2011 food prices had established new historical highs and prices tend to volatile ever since. To protect themselves from the effects of international commodity markets, countries around the globe need to stabilize their domestic food production. Industrialized countries like Japan purchases food from all over the world in years of poor harvests, but developing countries cannot do this. 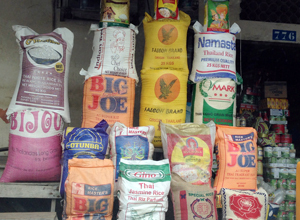 Many developing countries depend on import for their staple grains. This has a historical background. Colonial powers forced colonized countries to produce export crops such as coffee and cacao for export to developed countries during colonial period. This situation exposes the producer countries to significant impacts from wide price swings for agricultural crops in international markets. These effects are particularly conspicuous when prices soar due to poor harvests. One example is the rice shortage that occurred in 1993 in Japan. Faced with a poor harvest caused by a cool summer, Japan started to buy up rice worldwide. The effect was that developing countries dependent on grain imports were left unable to buy rice, which reportedly caused hunger in some countries. Grains are not only used to fill peoples’ stomachs but also as feedstuff for livestock, such as cattle and pigs, and as raw materials for sweetener and bio-fuels. Surging food prices and global food crises are giving rise to growing concerns about how stable food supply can be ensured. It has triggered some industrialized countries going as far as attempting to buy land for food production in hunger-stricken countries in Africa and elsewhere. 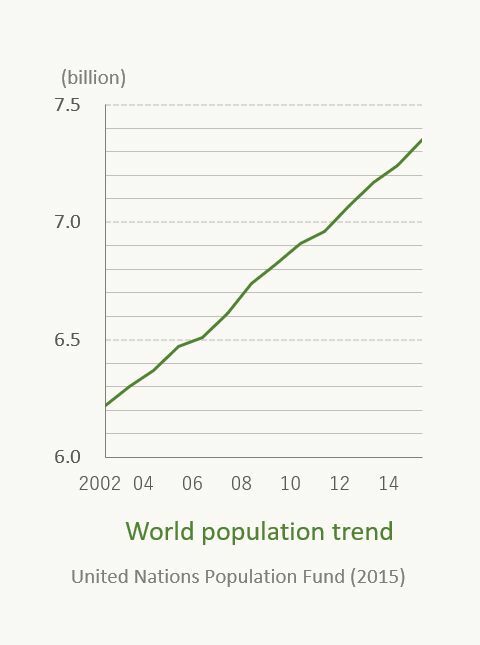 The global population keeps growing, from 7.3 billion in 2015 to an estimated 9.7 billion in 2050 (*4). In order to ensure food supply in step with the continuing population growth, food production will have to rise 1.7 times compared with today. However, available land and water resources has limits for such increases. Measures are needed to prevent the contest for food and resources for food production from escalating into major clashes between nations. Sufficient quantities of global food production alone do not ensure everyone on the planet have enough to eat. Additional important requirements are stable income to buy food and the availability of food for those who need it. No less important is for people to be able to decide what to produce and as opposed to simply filling stomachs, to have access to food that is safe and nutritious. All people have the right to food as a birthright. It is each country’s responsibility to enable its citizens to have constant access to sufficient food, both in quantity and quality to enable them to perform healthy and social activities. However, when for some reason this cannot be done, the cooperation of the international community including our own are indispensable. In 2015 all member countries of the United Nations adopted the Sustainable Development Goals (SDGs) and pledged to put an end to hunger by the year 2030.